NYC mentees meet DC mentors, our recent inter-chapter exchange! 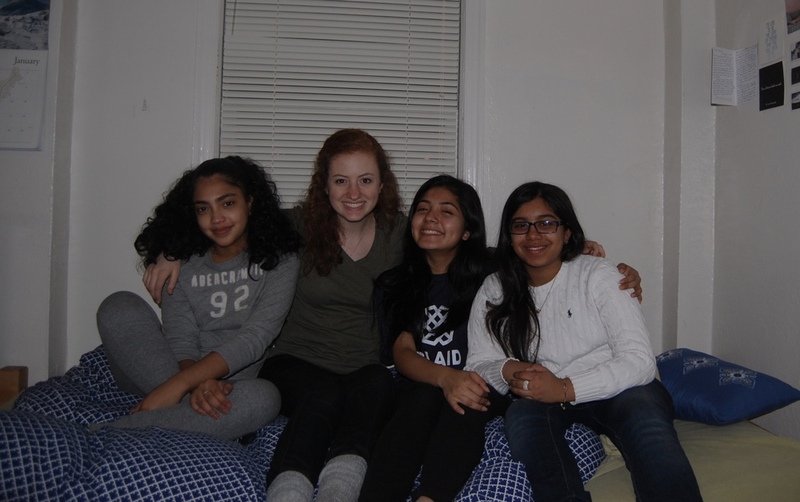 Seven mentees from New York City joined the DC chapters of Project Rousseau for a weekend in January, and throughout the course of this weekend we learned more about our Nation’s capitol, we made new friends, and we grew a new appreciation for Project Rousseau. The students arrived in the District on a Friday afternoon, and from there it was all adventures. Our chapter at the George Washington University greeted them at the metro, and we could tell that they were all tired from the long bus ride consisting of Frozen re-runs and conversations about SAT prep and One Direction alike. However, regardless of their travel each on of them greeted us with a smile on their face. After some introductions we set off to grab some dinner and visit the monuments of DC. It was at these monuments that the students began to open up to our e-board members and their personalities came to life. Throughout the trip Andrew never failed to throw trivia their way, and each one of them answered the questions without fail. We felt a sense of pride for them, even though they weren’t our mentees, when it was clear to us how intelligent these students are, and how hard they have been working to make full use of the resources Project Rousseau provides them. Each one of our mentors from GW had conversations with the students, and we learned so much about the things they like to do for fun, and the differences between their realities and ours. The mentees visited each of the three monuments, and at each one they took hundreds of pictures- selfies and otherwise- because it was obvious that they never wanted to forget that moment. Something that wasn’t obvious at first, is that we as mentors never wanted to forget that moment either. The students had the chance to visit museums, tour both GW, and Georgetown, and just see the city for their first time. GW’s chapter of Project Rousseau is still in the works of becoming fully operational, but having the students visit from NYC gave us a new kind of motivation that we wouldn’t have been able to find elsewhere. Many of our mentors had a chance to meet both the NY students and Andrew, and through these meetings many of them finally realized the full impact their involvement in Project Rousseau would have on our mentees. We understand it may be difficult at times, but after seeing the opportunities Project Rousseau has given the mentees, we are more than ready to make a similar change in DC. Newer PostProject Rousseau Copenhagen Exchange 2016! Older PostProject Rousseau Chicago Students visit Sidley Austin Law Firm!